Dubai-UAE: 29 April, 2018 – His Highness Sheikh Mohammed bin Rashid Al Maktoum, Vice President and Prime Minister of the UAE and Ruler of Dubai, will honour the most altruistic individuals from the Arab world who have dedicated their lives to helping others during an award ceremony at the culmination of the second edition of the Arab Hope Makers initiative. At the gala event, set to take place on May 14 at Dubai Studio City, the top Arab HopMmaker for 2018 will receive the grand prize of AED1 million to continue their charitable efforts that inspire hope. The second edition of the initiative, dedicated to acknowledging efforts to spread hope and improve the lives of people in the Arab world and beyond, invited the participation of individuals, groups and organizations committed to humanitarian and community work in various fields. The call received an overwhelming response with some 87,000 submissions from 15 Arab and 20 non-Arab countries, surpassing the previous year’s figures by more than 30 percent. The initiative recorded a notable increase in submissions from young Arabs based in western communities, especially in Europe, highlighting projects that aim to assist those in need, particularly immigrants and refugees, in rebuilding their lives. The entries also included philanthropic initiatives that seek to enhance women's contributions to society through projects in vital sectors, such as education, medicine, public health, culture, environment and charity. The second edition of the initiative covered the most pressing societal challenges in the Arab world. Local community service initiatives accounted for 36 percent of all entries, while projects in education amounted to 12 percent and health initiatives made up six percent. From among the submissions, 15 candidates were selected and invited to Dubai to meet with a panel of judges that included representatives of the Mohammed Bin Rashid Al Maktoum Global Initiatives (MBRGI), as well as members of the philanthropic community and media representatives. During the interaction, candidates presented their efforts and achievements in front of the jury. The panel then shortlisted the most deserving participants based on the positive impact of their projects on communities, their role in instilling a culture of hope in the Arab world and addressing the challenges facing their societies through innovative ideas and initiatives. 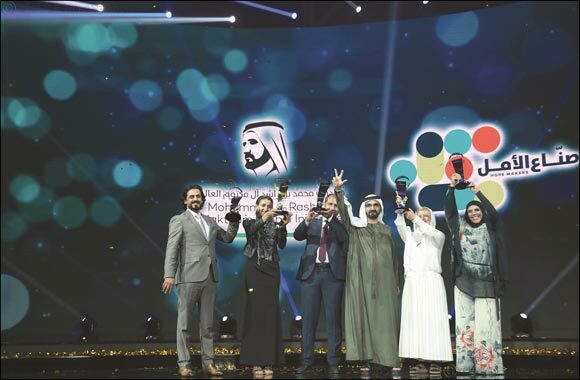 The first edition of Arab Hope Makers received a significant uptake across the Arab world drawing more than 65,000 participants, five of whom were honored for dedicating their lives to spreading hope.